Perfect Families Don’t Exist. Real Ones Do. Meet Bievo, the family organizer app that grows and changes with you. We think you’ll love it! Try Premium for free – no payment required. Trying to get the family together can be complicated. Since everyone’s schedules are too different, finding a common time to run errands together can be pretty hit or miss. Since everyone’s busy with school, work, and other daily tasks, organizing anything seems impossible. An online family organizer app, however, can make it all come together. Bievo is an on-line organizer application that works for any family structure. This app has everything a family needs to stay organized: shopping lists, family medical information, calendars, and co-parent and caregiver access. It can also work seamlessly between your desktop and mobile devices. Calendars: allows users to customize their views according to family or personal events. View your family calendar and work calendar separately with this feature. Task Lists: this feature creates to-do lists, where you can schedule events and set deadlines. Family Medical Information: contains information of all important family contacts. It also manages your personal and group imported contacts. Family Circles: shares birthdays, anniversaries, and selected events to larger groups. Feel free to create a circle with just you and the kids and another with the in-laws. Co-Parent & Caregiver: offers access to caregivers and co-parents to the family’s official Bievo account. Caregivers, on the other hand, receive limited access to an account that includes shopping lists. On-line Calendar and Automated Synchronization: allows for the easy import of your children’s school, sports, and other activities. The family schedule organizer will automatically update your calendar if changes occur. Family life is never simple. Organizing and planning it should be. Your family is active and operating at full tilt. Think of Bievo as life’s GPS in one simple family planner. We’re here to help show you the way and keep family life on an even keel. A busy mom or dad can use Bievo to tame the wild out of school scheds, carpooling, grocery shopping, doctor visits and … Figure out who was supposed to pick up Aunt Helen at the airport (3 hours ago)! We know, just like life, you’re not perfect. Let’s shoot for fabulously functional and keep you cruising along! School, work travel, cookouts, book group, car pools, soccer, hockey, baseball, lacrosse… Feeling cross-eyed yet? Keep an eye on coming, going and doing with shareable calendars that track of your entire family’s schedule in a single application. Who was supposed to feed the dog…?! Sound familiar? Let Bievo remind them instead. 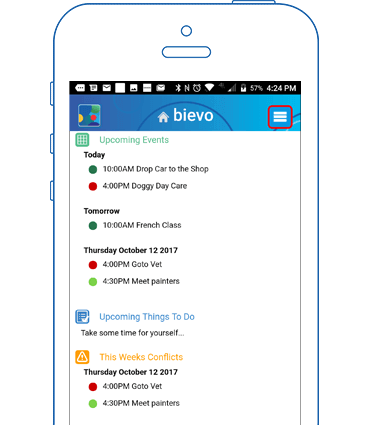 These task lists are up to you to design and assign whatever to whoever is within your Bievo family. Embrace your inner Task Master! In an emergency, or the daily hustle, having contact information for all of the important people in your life in one place is essential. This is that place. Share your family contacts so everyone has access to friends, coaches and teacher contact info. Sharing responsibility with a non-custodial parent is not uncommon. At Bievo, family comes first and helping to control life’s chaos is our goal. Whoever makes up your family can stay connected where and when it matters. We are all about family. With family you maintain a small, private & safe network giving you the ability to share the important information in your family’s life. It’s your essential toolbox for storing medical, school, and work information in one central location. You shop multiple stores a week (sometimes more than once!). Never again find yourself at the grocery store while your shopping list is on the kitchen counter. Access your shared family shopping list at your desktop, tablet or on your phone. Share it with your family and let everyone add the groceries they need. Reduces trips to the store to pick up forgotten items. Go ahead lump people together! When you set up multiple groups, wide brush communication and scheduling becomes infinitely simpler! With groups and connections, get automatic calendar updates or organize events and communication for small clubs and teams. These days, Nannies & Grandparents play a big role in helping with children. Our family planner allows you to give Caregivers limited access to family information so that they can pitch in. Import multiple online calendars, including Google, iCal, and calendars embedded within other sites. … when schedules change, the Bievo family planner lets you know. Easily share your important family information. Our premium subscription cost only $12.99/year for the entire family.